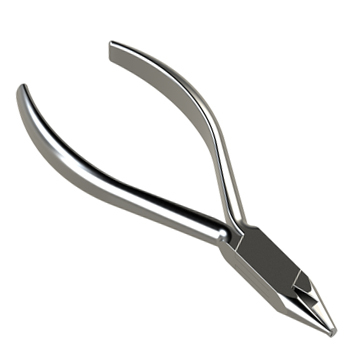 It is used for crimping hooks to the arch wire. 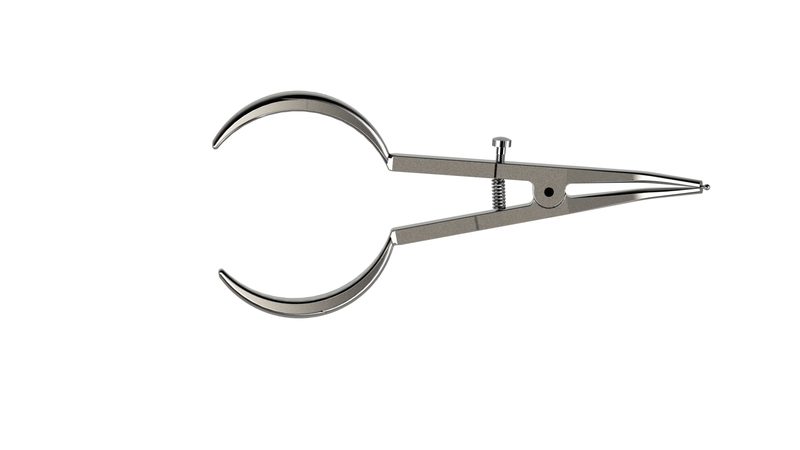 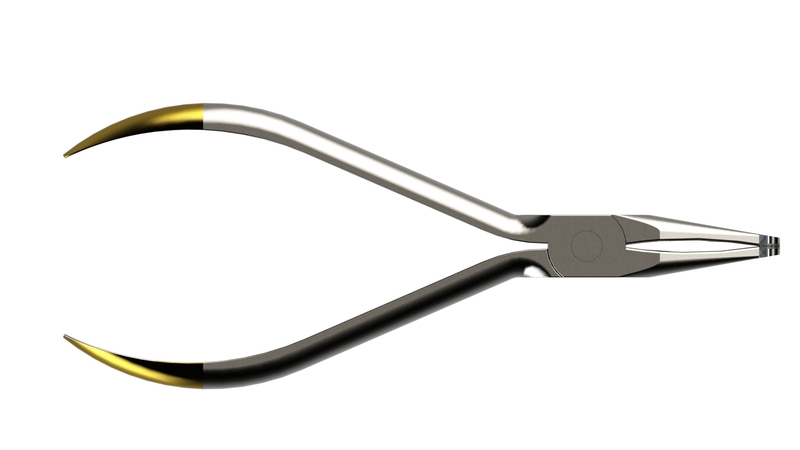 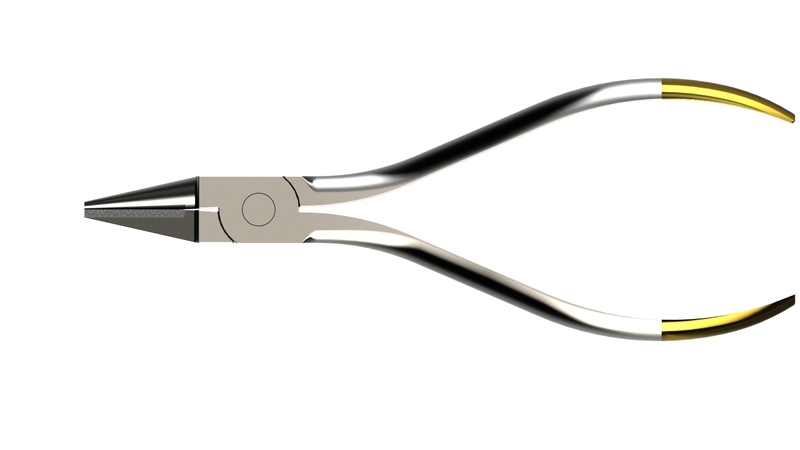 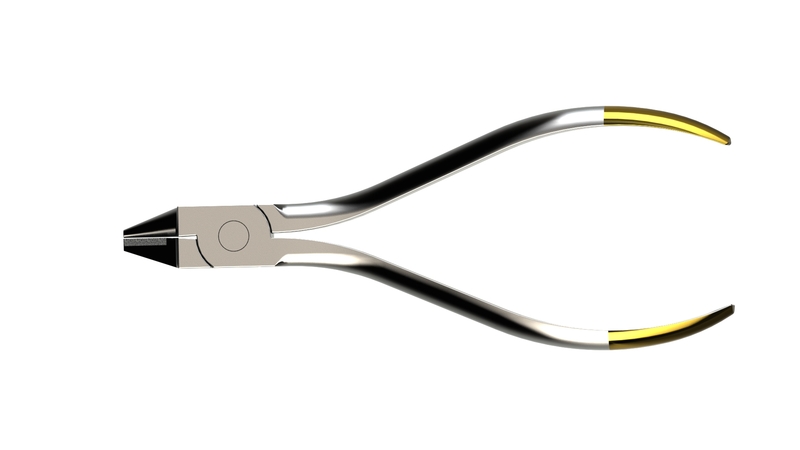 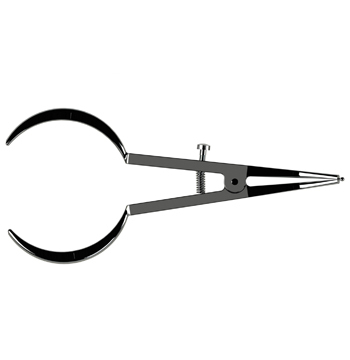 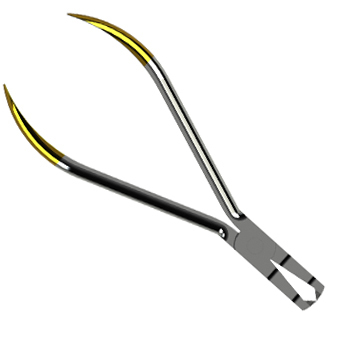 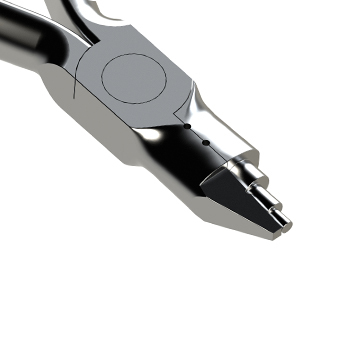 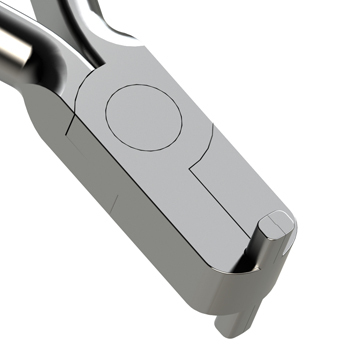 The plier design gives it a firm grip on the hook as it is delivered on to the arch wire and securely crimps the hook at three points to prevent flares at the ends. 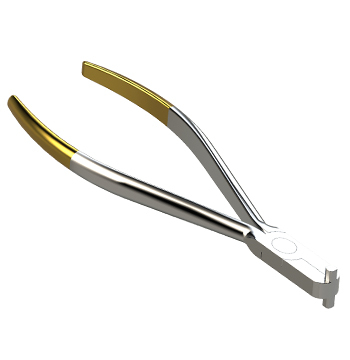 It is used to make ” V” bends or positive stops anywhere in arch wires. 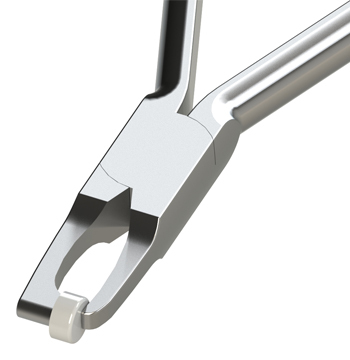 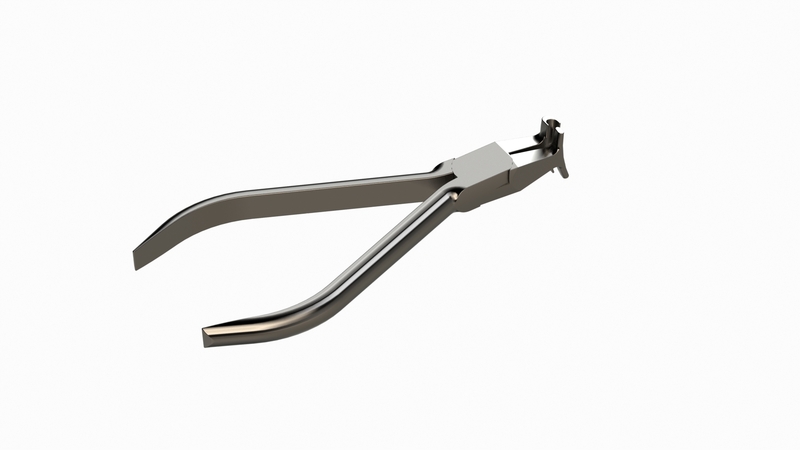 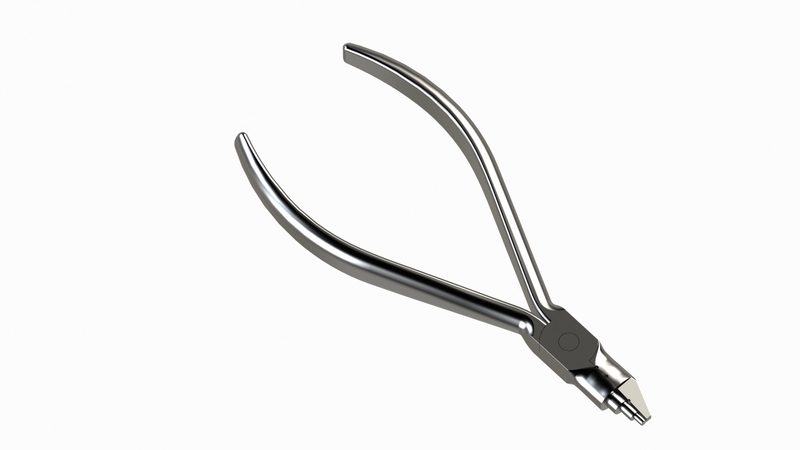 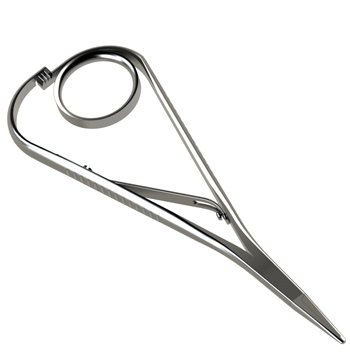 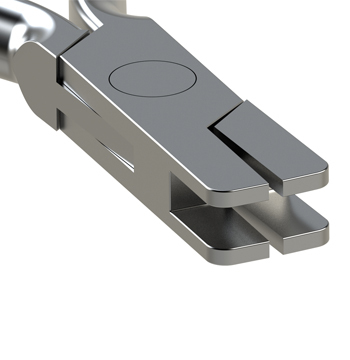 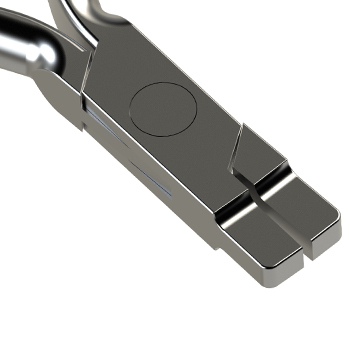 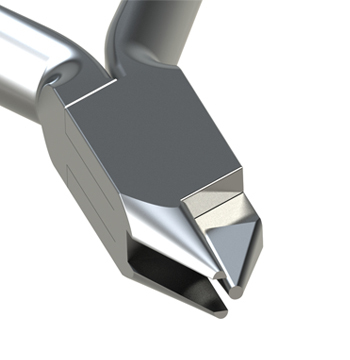 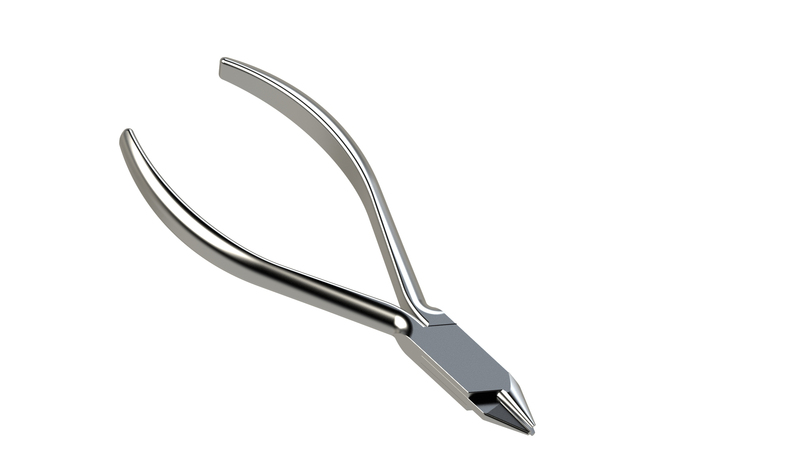 It is used to bend distal ends of NiTi arch wires into the buccal tubes. 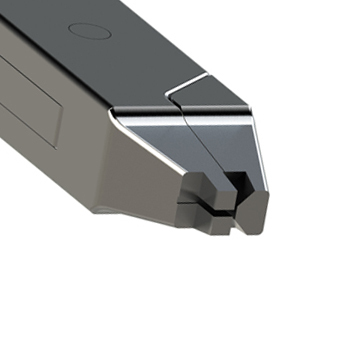 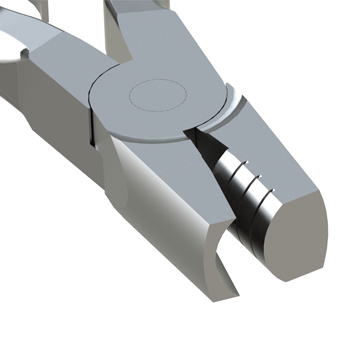 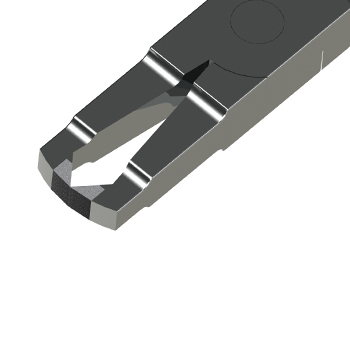 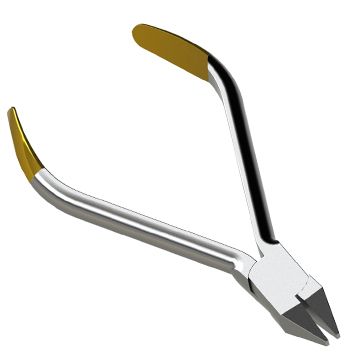 The plier angle is optimum for working behind the tubes. 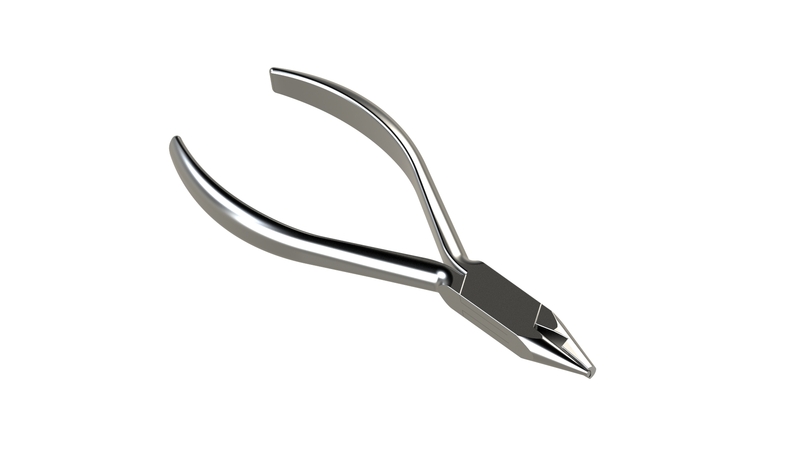 It is used for forming the Adam’s Clasp. 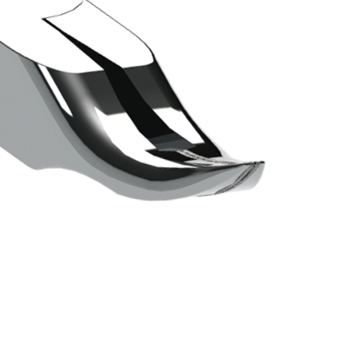 The sides of the beaks are flat and the inner surfaces are textured and at the same time are neither polished or serrated or grooved. 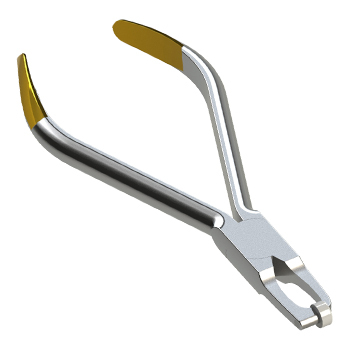 It can be also used for adjustment of headgear and face bow. 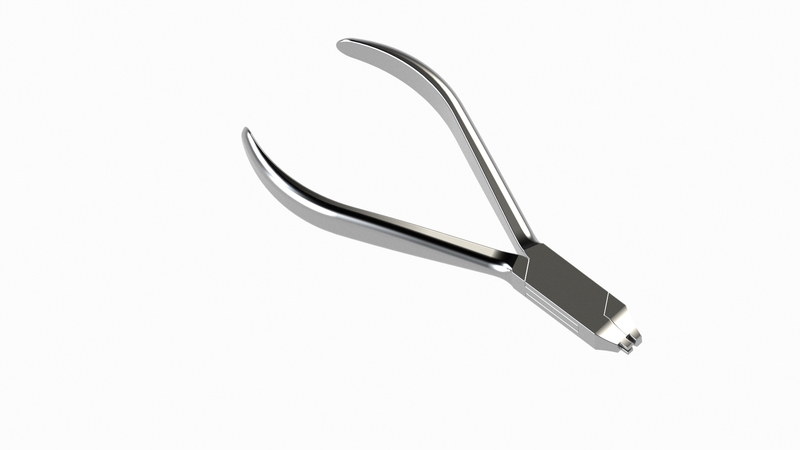 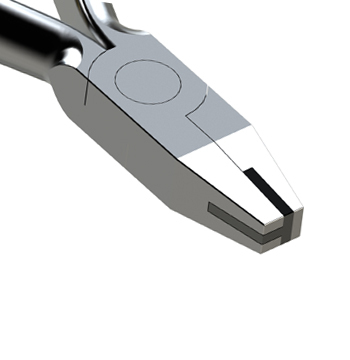 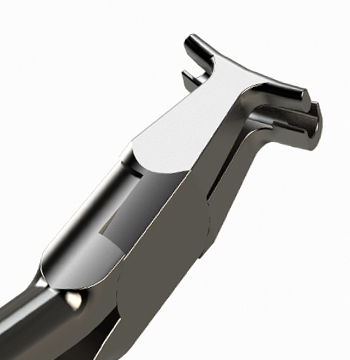 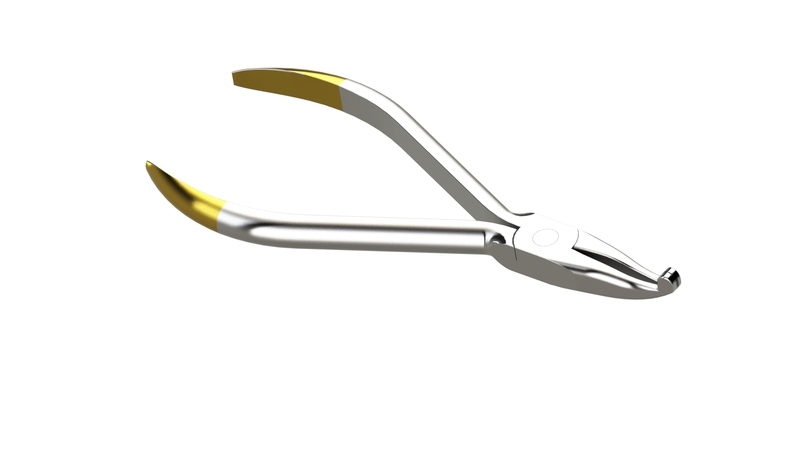 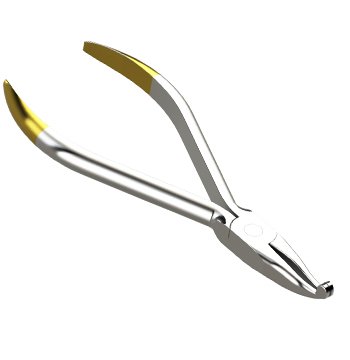 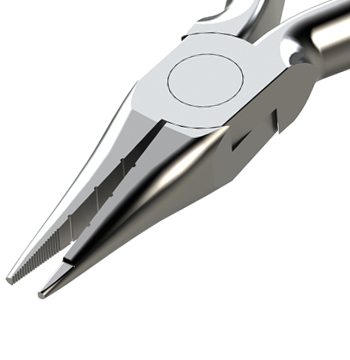 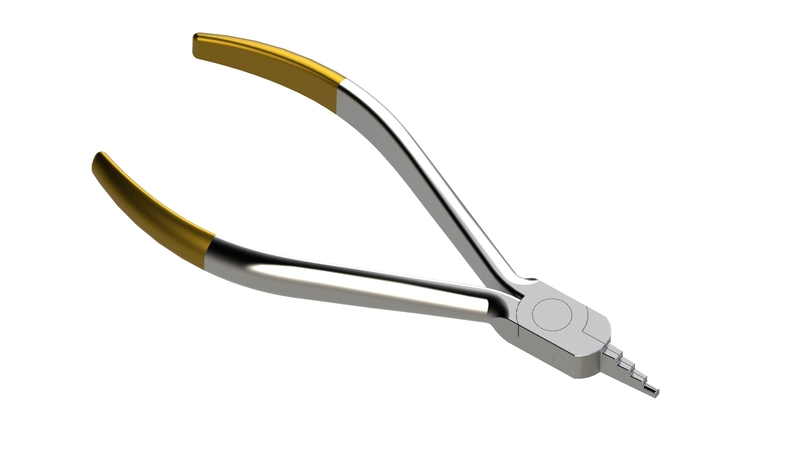 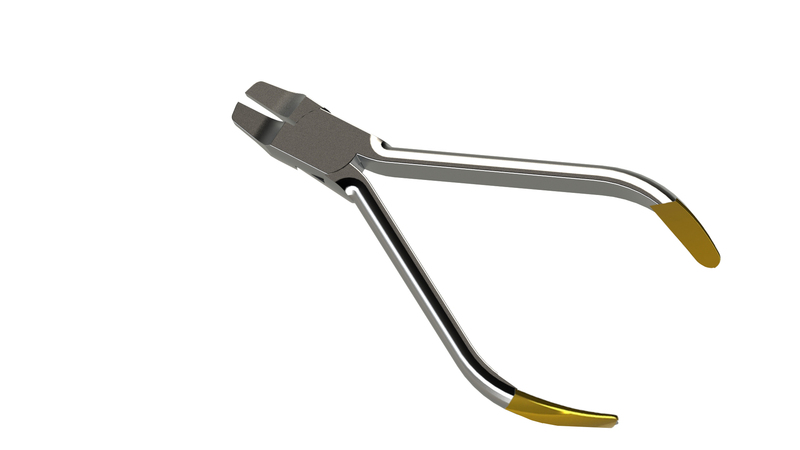 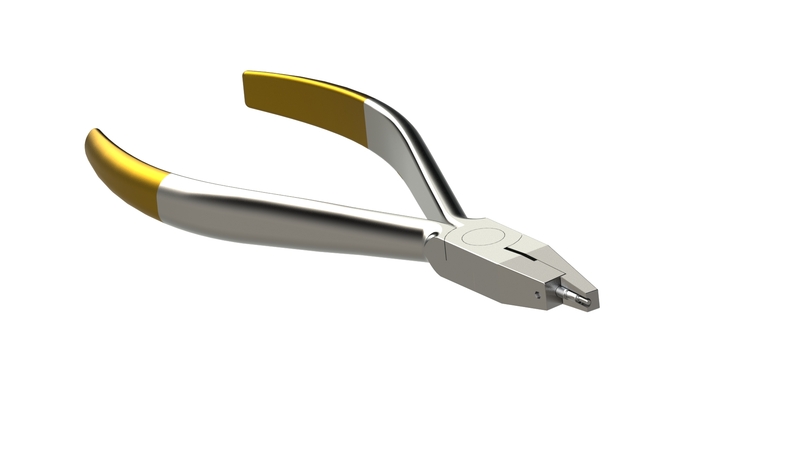 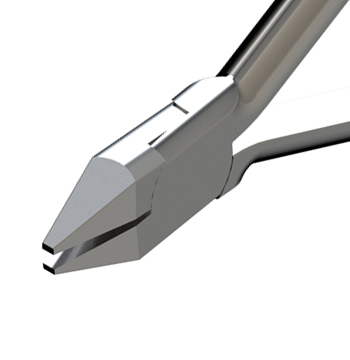 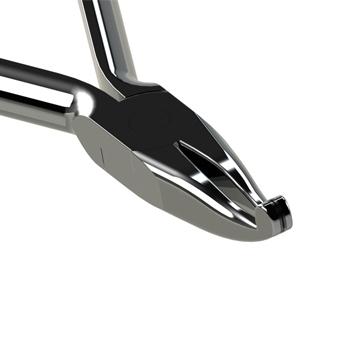 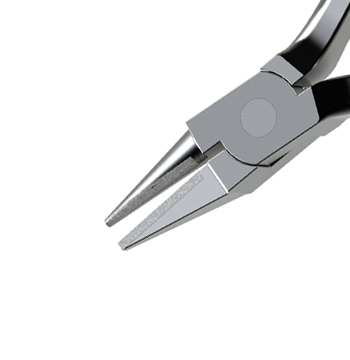 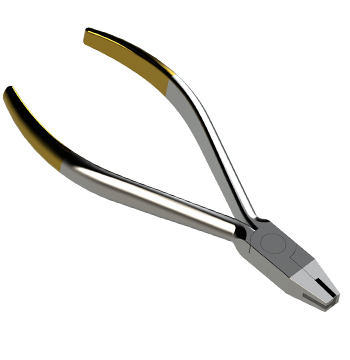 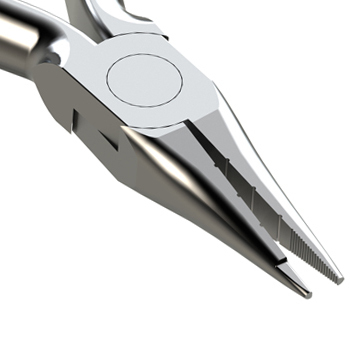 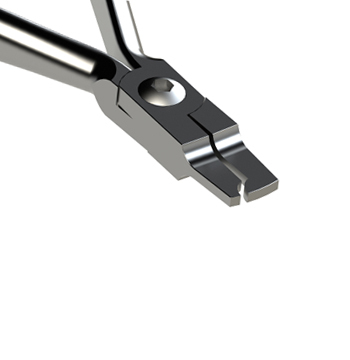 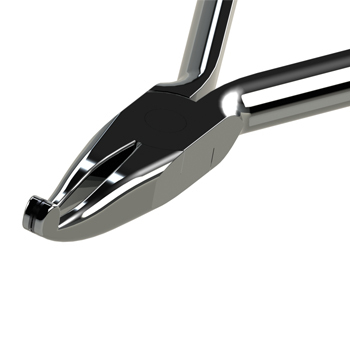 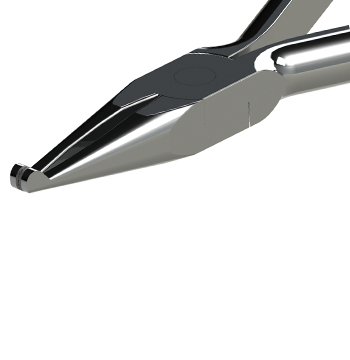 It is used to remove posterior metal bands with maximum patient comfort. 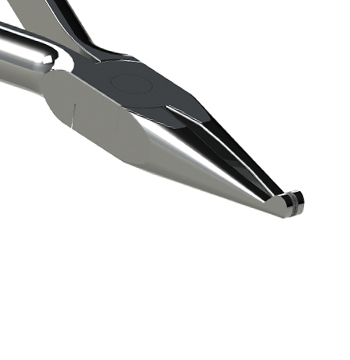 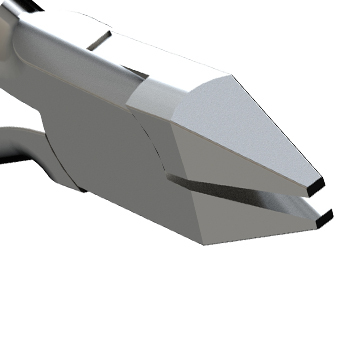 The padded tip rests on the occlusal surface of the molar tooth and the non padded remover tip catches the edge of the band for upward or downward removal. 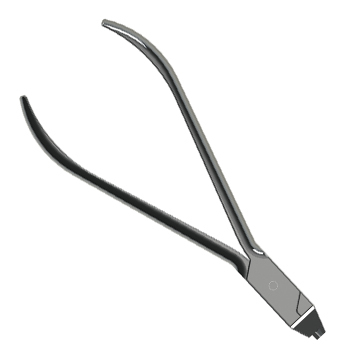 It is ideal for forming square or rectangular arches with wires from 0.016” to 0.022”. 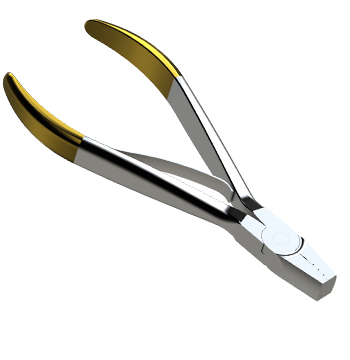 It helps increase the curvature in the arch wire. 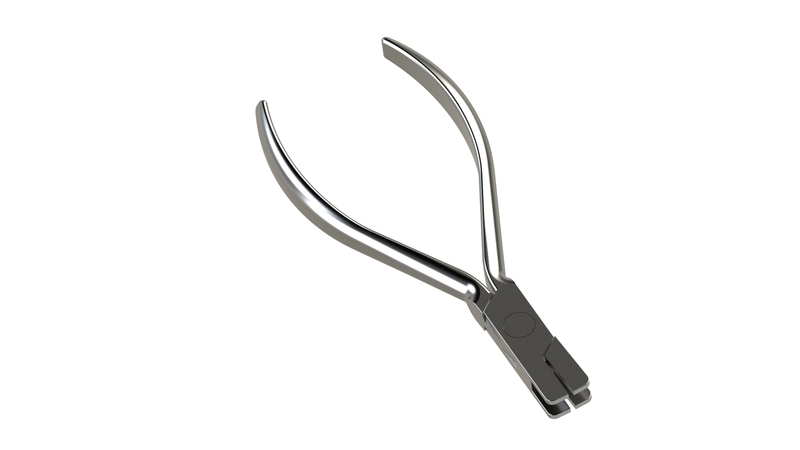 It is used to hold arch wires. 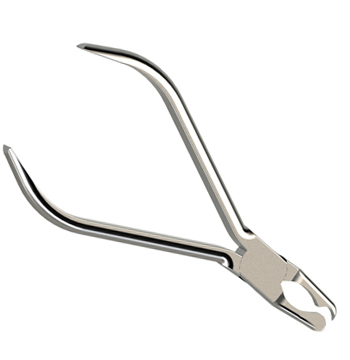 Matching serrated pads assure a firm grip and its rounded tips provide patient safety and comfort. 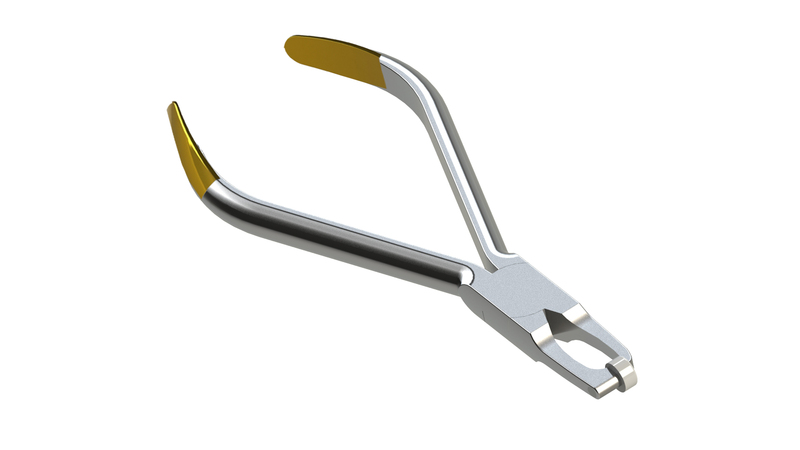 Its special tip design makes it suitable for seating individual anterior bands. 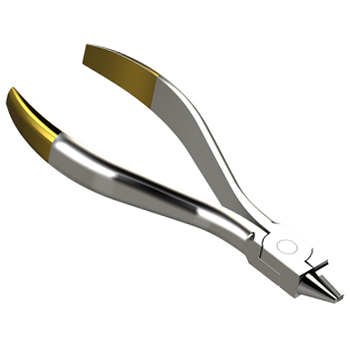 It is a versatile utility plier for working on wires up to 0.030”. 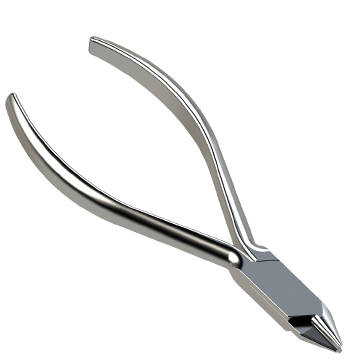 The round and pyramid beak is beveled and smooth to prevent scoring. 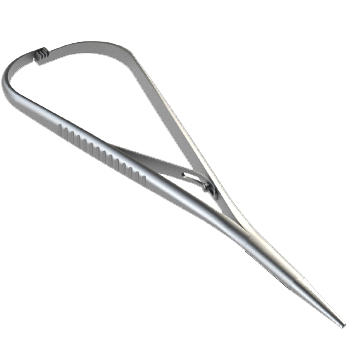 It is used to hold arch wires. 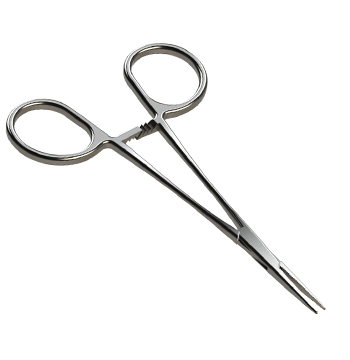 Matching serrated pads assure a firm grip and its rounded tips provide patient safety and comfort. 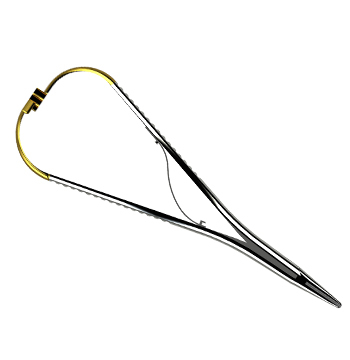 Its slender curved tip makes it suitable for working in posterior areas. 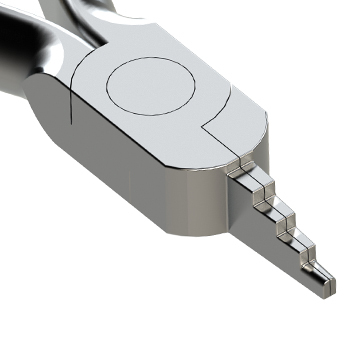 It is a versatile utility plier for working on wires up to 0.030”. 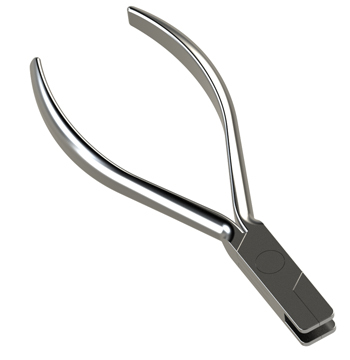 The round and pyramid beak is beveled and smooth to prevent scoring. 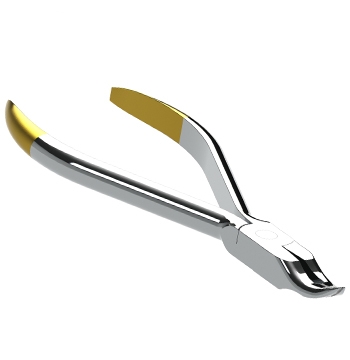 The tapered beak helps bend small diameter loops. 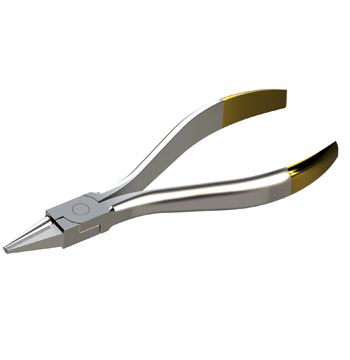 The precision grooves assure accurate bending and closing of loops and also provides a firm grip while working with wires.It is a versatile utility plier for working on wires up to 0.030”. 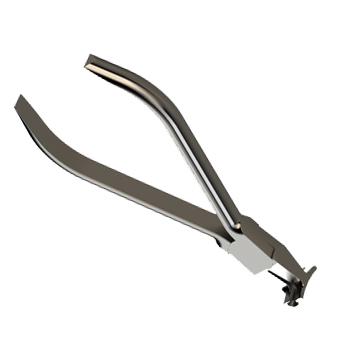 The round and pyramid beak is beveled and smooth to prevent scoring. 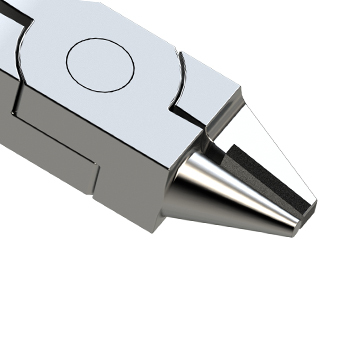 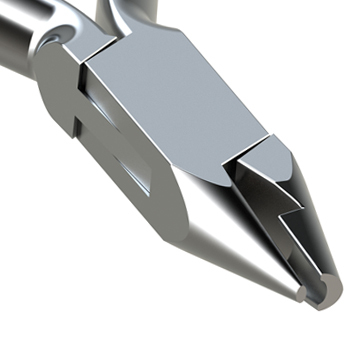 The serrated tips hold wires firmly at convenient work angles. 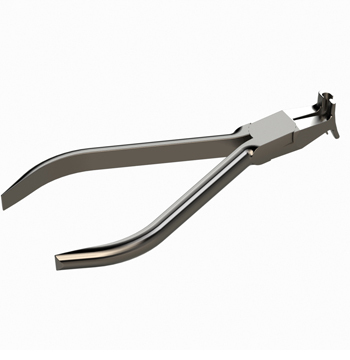 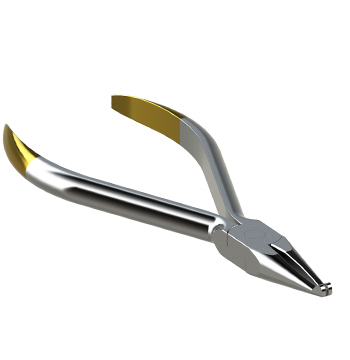 The tapered beak easily fits between brackets thus facilitating better grasp of arch wire and guiding the wire into the buccal tubes. 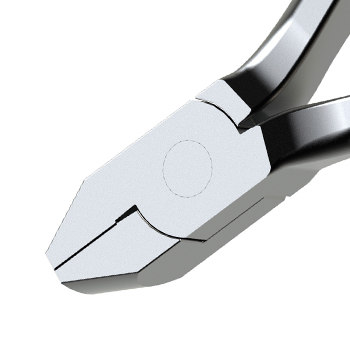 It is our most popular utility plier. 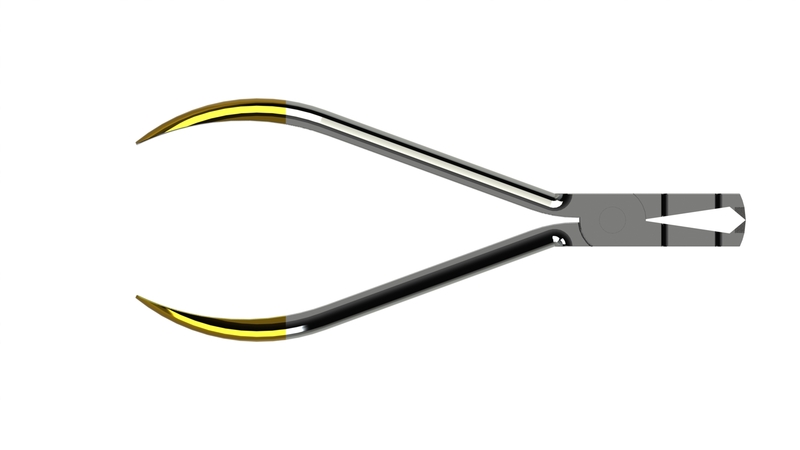 It can be used to form omega loop and multiple loops of same dimension. 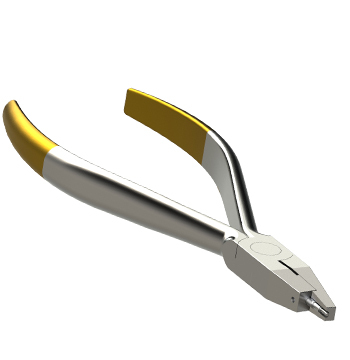 The round beak has three sections of 0.045, 0.060 and 0.075 inch in diameter and the cylindrical beak is electro etched to prevent wire slippage. 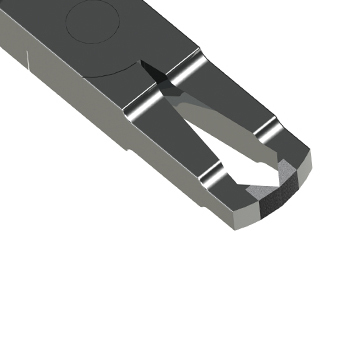 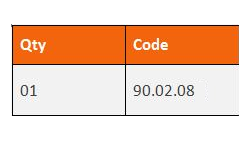 Can work on wire 0.021 x 0.028 mm . 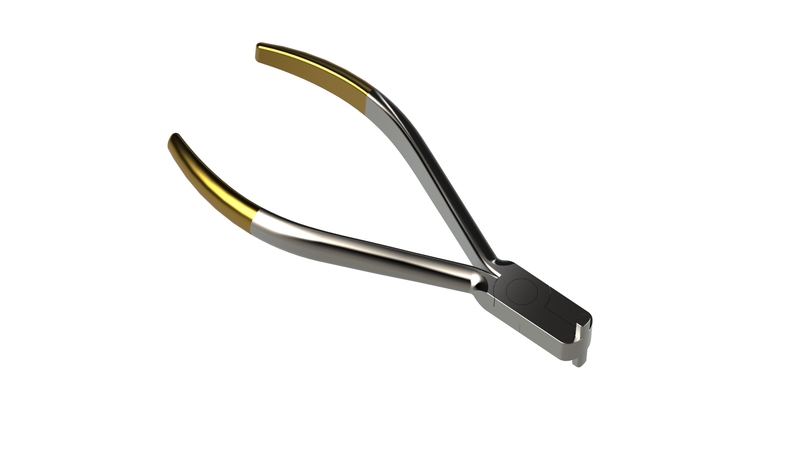 The concave beak has parallel serrations to hold the wire at 90 degree angle while forming loops. 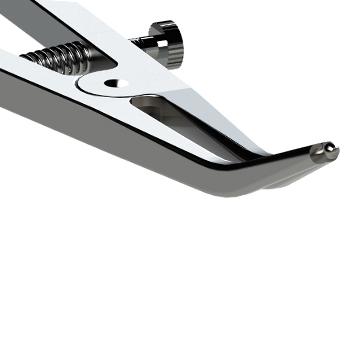 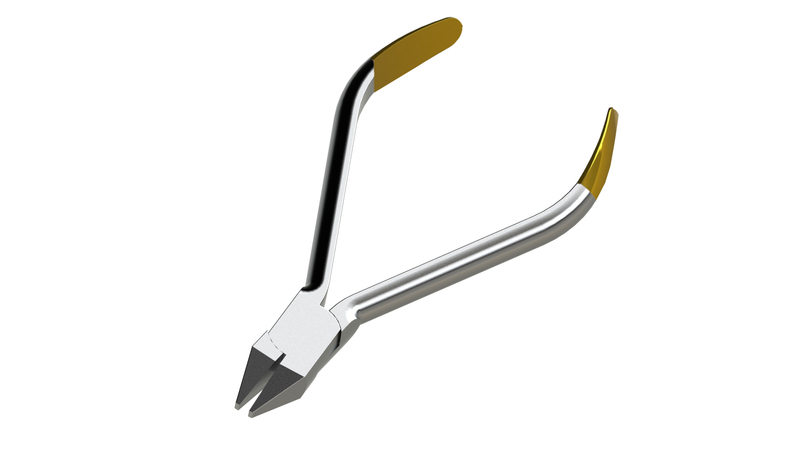 It is ideal for bending square and rectangular wires. 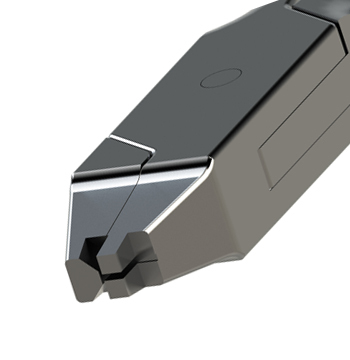 Beveled edges prevent wire scoring. 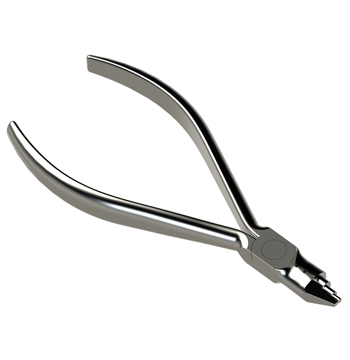 It is used to remove bonded brackets. 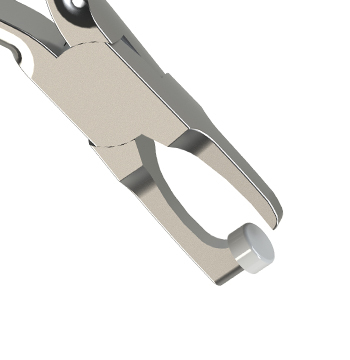 The wide tips wedge between both the edges of the base of the bracket and the tooth surface thus easily lifting off the bracket. 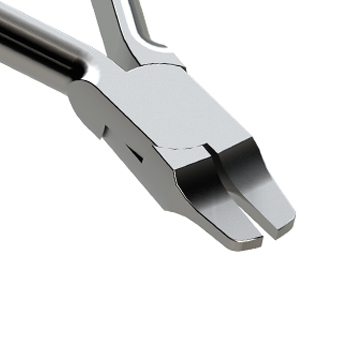 Stainless Steel and Autoclavable. 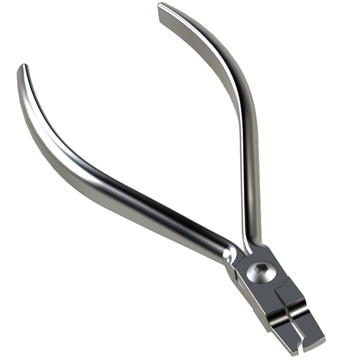 It is used for putting permanent centerline & positive stop anywhere in the arch wire. 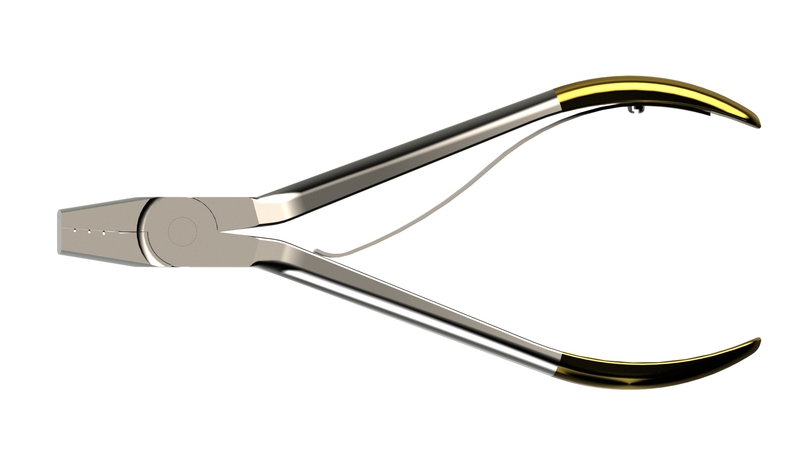 It is used for expanding elastic separators or separating modules before positioning them interdentally. 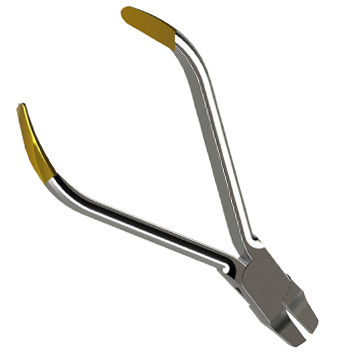 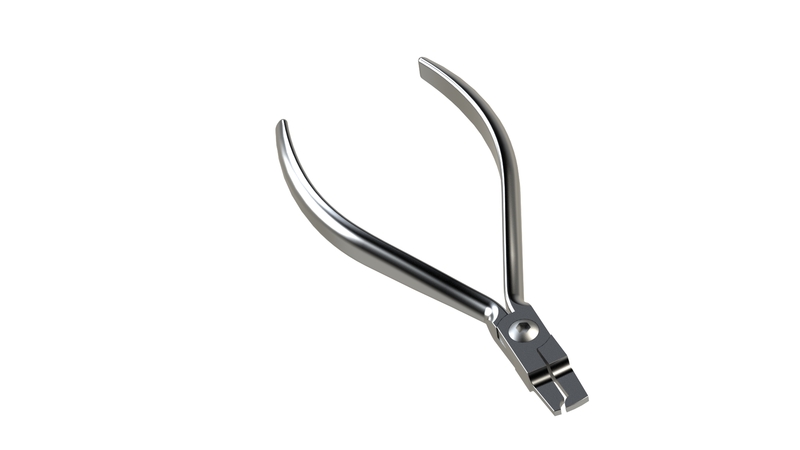 It is great for handling small elastic modules and is used for placing elastic ligatures or tightening ligature wires around brackets. 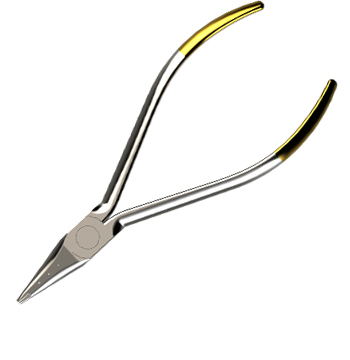 It is available with straight and curved tips and has a locking mechanism with serrated beaks and fine tips for better grasp and good control. 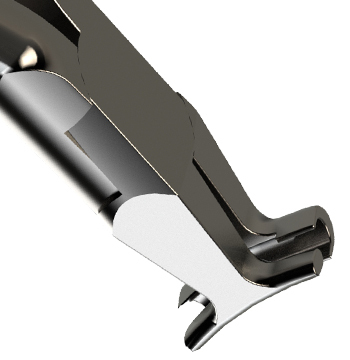 It is suitable for contouring and adapting bands when band edges get bent at times, during band placement. 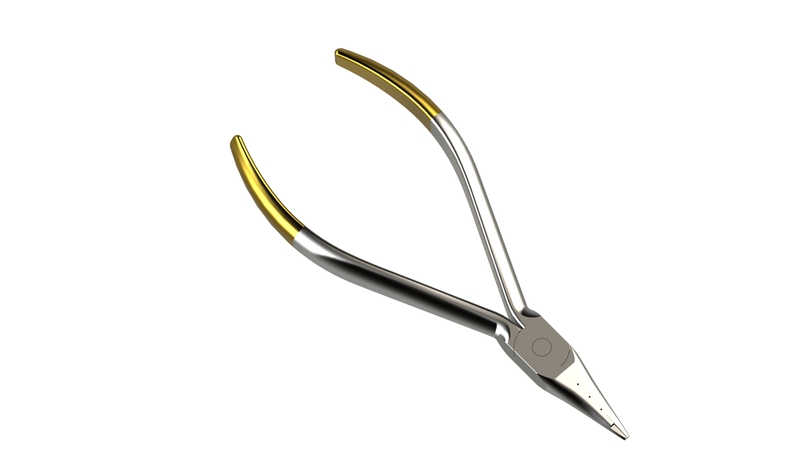 It is suitable for working with ligatures and twisting them to complete ligation. 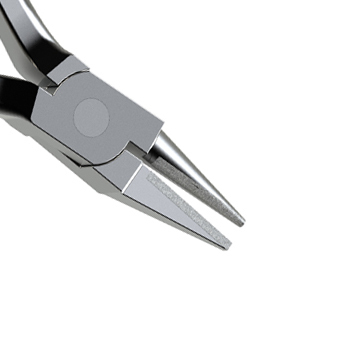 The Tungsten Carbide make, results in high durability. 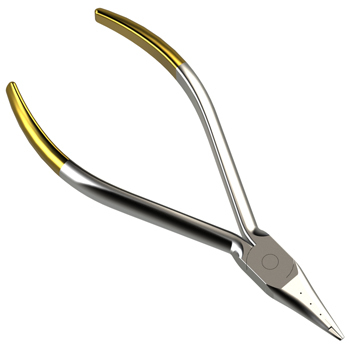 It is suitable for working with ligatures and twisting them to complete ligation. 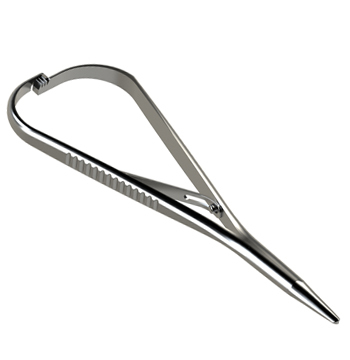 It is practically ideal for ligation. 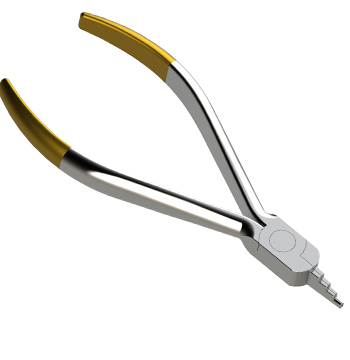 Its serrated tips allow better grip of fine ligatures and elastomeric modules. 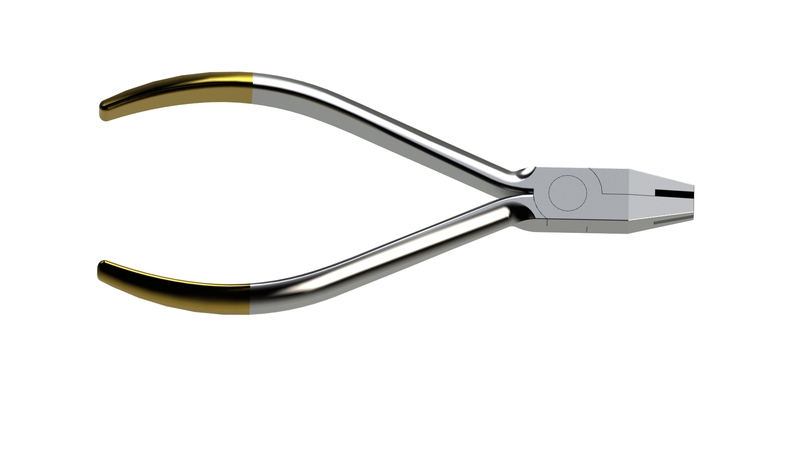 It has a locking spring mechanism that helps quickly open and close the plier. 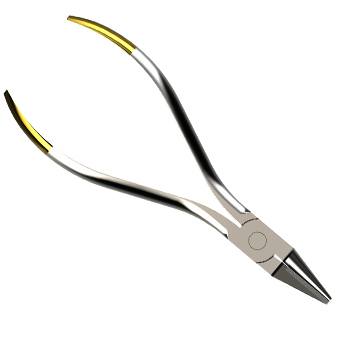 It is used for bending wires up to 0.035” or cutting up to 0.028”. 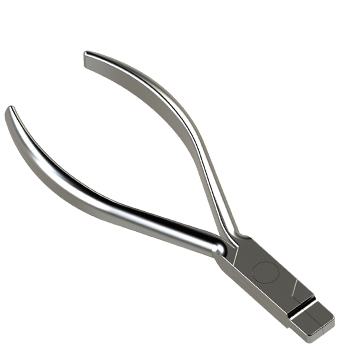 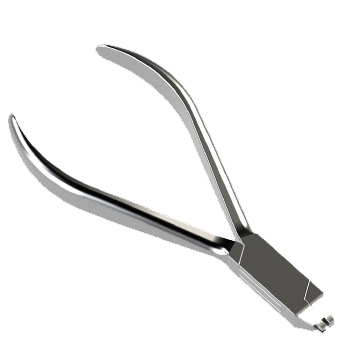 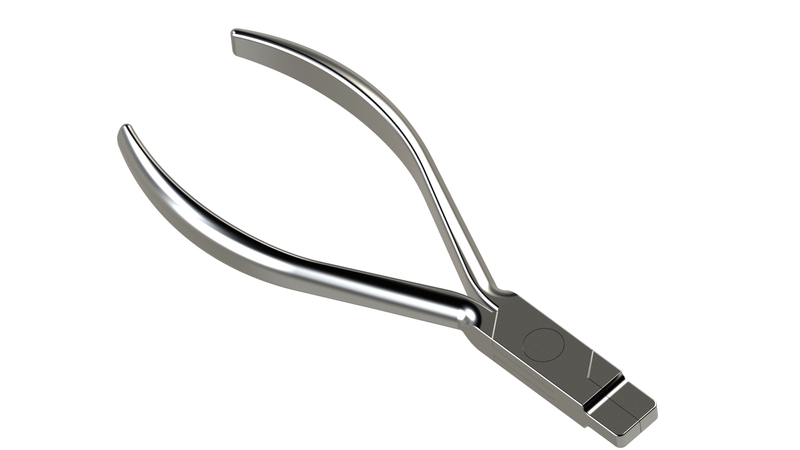 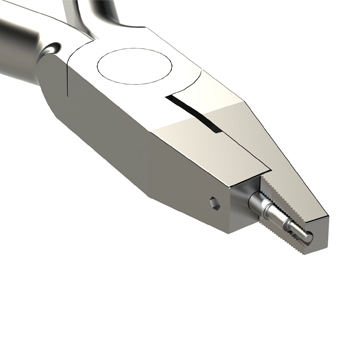 This is a stainless steel tool to contour gingival surface of preformed bands and crowns to provide better tooth anatomy which is possible due to its convex and concave beaks.